Fall is in the AIR!! 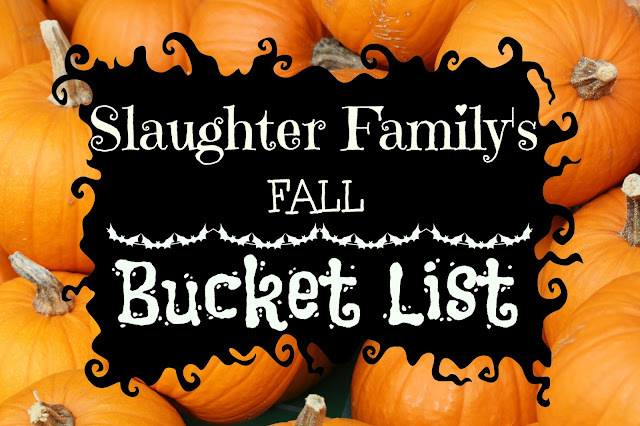 Our family is crossing things off our bucket list this month! We already took care of this one and I can't wait to see those images! I prefer to make all kinds of varieties of chili and taco soups ALL fall and winter long. One of our very favorite traditions is trick-or-treating with friends. There aren't many things I love more than a front porch all decorated up for fall with pumpkins and mums! I have to finish ours up this week, so we can take as many pictures as possible with that fall goodness as the background. Every year I enjoy taking the kids to one of Tab's football games. This year I'm not sure which one it'll be, but I have plans to load up all three of my crazies and attend. We've already started tackling this at our house. Nixon loves them. Ebby Lee watches and then later tells me how scared she was! ha! By the way, I'm talking Disney Halloween movies...nothing really scary. We big puffy heart the fair. My kids talk about it ALL YEAR LONG! We're going to this week and I'm not sure who's more excited...the kids or the parents. I can't WAIT for this to happen! I LOVE a fire in the fireplace on a chilly night! Last year we ran out of time and almost forgot to go to the pumpkin patch! This year we have "Pumpkin Patch Trip" on our calendar already. The Slaughter kids chose costumes weeks ago. Someone MIGHT have chosen a scary costume and is now too scared of the mask to actually wear it. We'll see how Halloween goes! haha! M and G have the perfect backyard for making smores! We love roasting some marshmallows on their patio. What's on your fall bucket list?? Maybe we need to add a few more! Am I forgetting anything? Eeks! It's the most wonderful time of the year!!! I want to do every single thing on this list. Like today. This post makes me happy :). We went to a pumpkin patch yesterday, I put the pumpkins and a mum on the front porch, and now I want like at least 5 more pumpkins! Spiced apple cider! The scent of apples and cinnamon and cloves... Have you smelled the cinnamon scented pine ones at the craft stores? Ahhh.. Fall is the best. I'm in Chicago, so our crisp air is getting pretty crisp! The best part of the weekend was getting out all of the fall/halloween decorations. The scary mask - too funny! Everything sounds so festive and fun! We're heading to the pumpkin patch this weekend hopefully, and I cannot wait!! Your list is perfect!! Sounds like a full fun October!! Favorite part was when you referenced Tab as 'Tab Slaughter.' Love it! He definitely should take charge of the pumpkin carving!! Which pumpkin patch do you recommend in your area? Yay Fall!!! Love your bucket list :) Can't wait to see your fall family pictures!